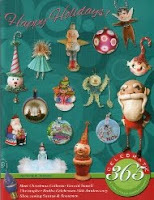 Happy Holidays: Hallowe'en and Vine 2011 - A Big Thank-You! Thank-you to everyone that stopped by my table to look at my work. You have no idea how much your words of encouragement were and are appreciated. Thank-you to all of my customers that purchased work from me. Thanks to all of the new and old internet friends that I finally got to meet in person. You were so encouraging. Thank-you Ginny Betourne and Christy Silacci for putting on such a high quality show. Your hard work pays off and is very much appreciated by everyone, artists and collectors alike. Here are some pictures from the show. There were more but I discovered that I had the camera set on the wrong setting the morning of the show, it was too late to take more pictures. There was so much great work there. Friday at 1:00 in the afternoon we arrived at the Hermann Sons Hall in Petaluma California. The hall had been decorated. Everyone was busy setting up their tables. All of the props and cloths for the table were brought down in my suitcase. The boxes had been mailed earlier and were sitting on the table ready to be unpacked. My finished table. This was the first time that I had put it together. I will be making a few changes for next years table. I hope to be there and I am planning for it. When I came to Arbutus hunter's table and saw her cotton batting figures I said, " Good heavens!" out loud. I like detail, it is important in my own personal work. Her work is so small, about 2 1/2". Each figure is meticulously painted. They are amazing. Brandi McKenna's moon's are so much like her. Her face is as animated as her moons. Charles Batte's witch figures and costuming were delightfully elegant. I finally met David Everett of Chickenlips, he is crouching down behind his booth. We both have a love of stage magicians. Christy Silacci's work is a hoot. She has a very odd, skewed, and fun look to her work. I like her large pumpkin guy. Edgar and Edgar had some great vintage items. The large light that you see in the picture is a crystal galleon. The faces that you see on the necklaces of Gabrielle Acevedo work are created with seed beads. Her bead weaving is very detailed, I love it. I finally met Jorge de Rojas of HoHoHalloween. His work is wonderful, there was a pumpkin guy in a cucumber(?) car with orange slice wheels that I particularly liked. Unfortunately this is the only part of one of the photos of Iva Wilcox's table that I could salvage. Thanks again Iva for the post show help. We arrived on Saturday morning around 8:00am. 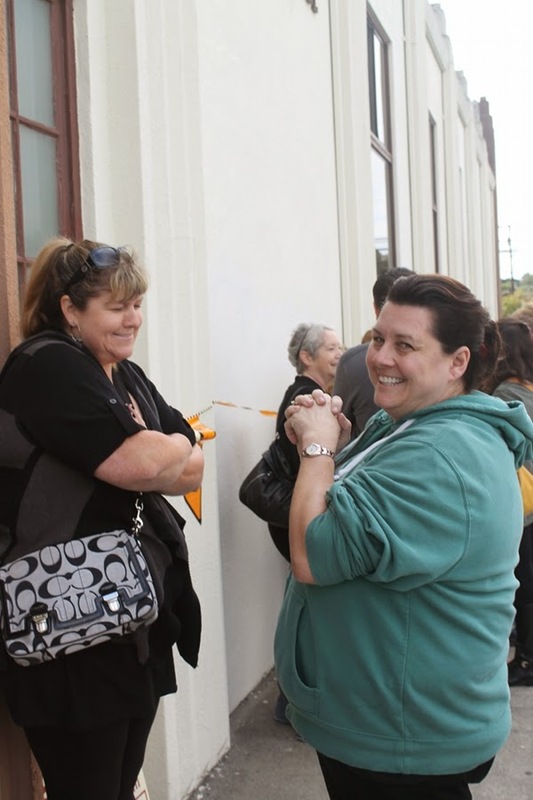 Loyal patrons were eagerly waiting for the doors to open at 9:00am. Kerry Howard Schmidt of Paper Moon Gallery creates her google eyed figures using needle felting. She had a bunch of off the wall but oddly endearing characters. I didn't get to talk to her, maybe next year. This is the second photo that has a Starbuck's coffee in it. 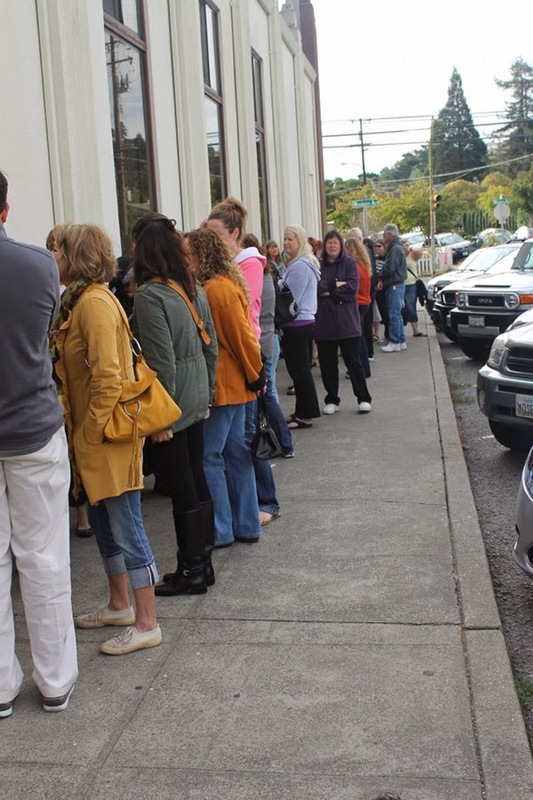 Where was everyone getting their Starbucks? Maria Grimes makes beautiful lampwork glass beads that she then uses to create her jewelry. 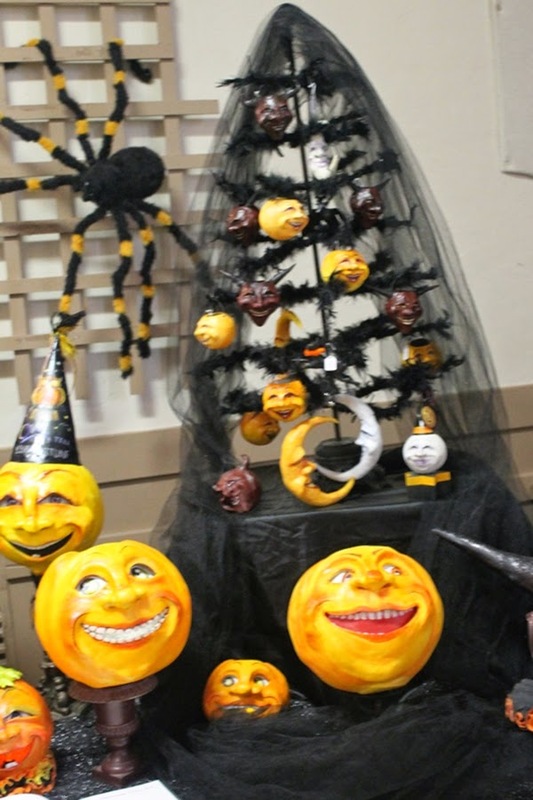 This is just a sample of some of the wonderful vintage Hallowe'en decorations that Mark Ledenbach had for sale. The patient customers were peeking in the windows to get an idea of what was available at this years show. These two women were first in line. I photographed them and said that they would be in my blog about Hallowe'en and Vine. This is a sample of the masks available from Mythica Masks. Pink Eyed Sissies had loads of Hallowe'en themed jewelry. Lori Rudolph of Retro Rudolphs is very busy with last minute preparations before the show. Her work, along with everyone else's work, is amazing in person. Here is another look at her table. 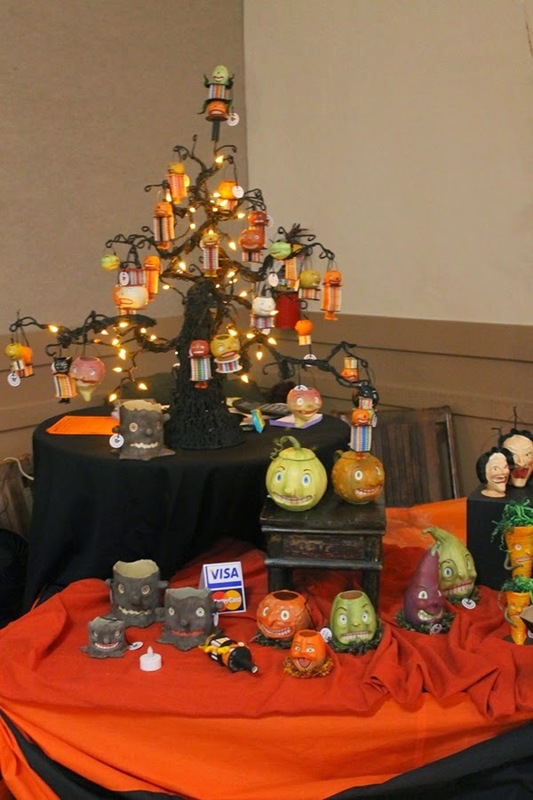 There are two pumpkins on a black stool in the centre of the picture, they are actually pumpkin teapots. I bought the smaller orange teapot. I love it. I wanted a piece of Sharon Blooms ceramic pieces but airline weight restrictions as well as packing it safely so that it wouldn't break made me decide that this year I wouldn't get a piece. 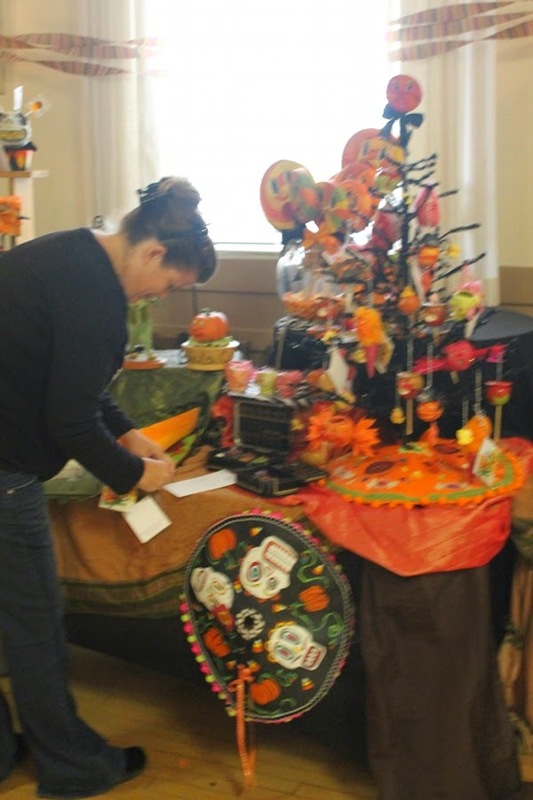 Amalia Schaeffer of Sweet B FolkArt is busy with last minute touch-ups. I have a pie of hers, I love it. Tina Haller had a predominantly black, white, and silver theme on her table. She had garlands, hats, and little haunted houses as well as a lot other fun items for sale. Vergie Lightfoot was behind me at the show. David Everett, Vergie, and myself formed one of the triangular pods in the centre of the room. The thick rich colour of her pieces and the incredibly deep texture of her painted surfaces is amazing. I love her pumpkins and cats. 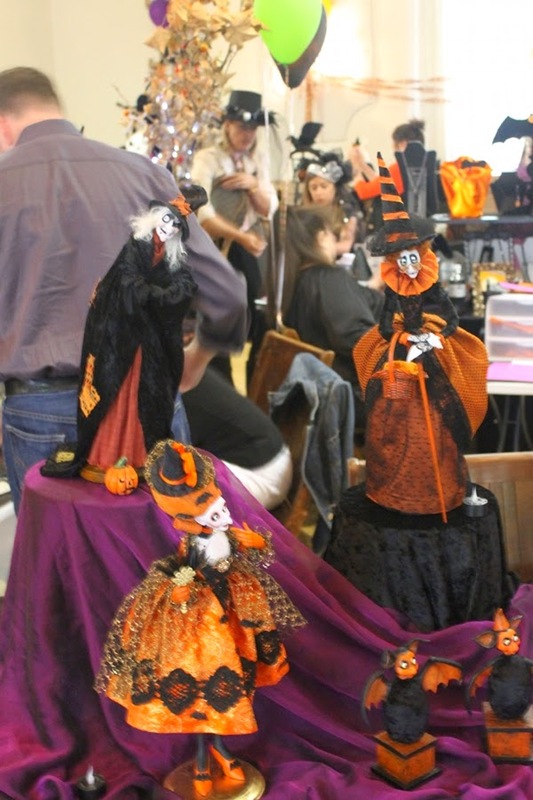 This is just a sample of the work that was available at this years Hallowe'en and Vine. If you can make it next year I hope to see you there. I didn't show any of Jack Roads work, that will be the next post. Thank-you so much. I will pass on the "Hello" to my wife.